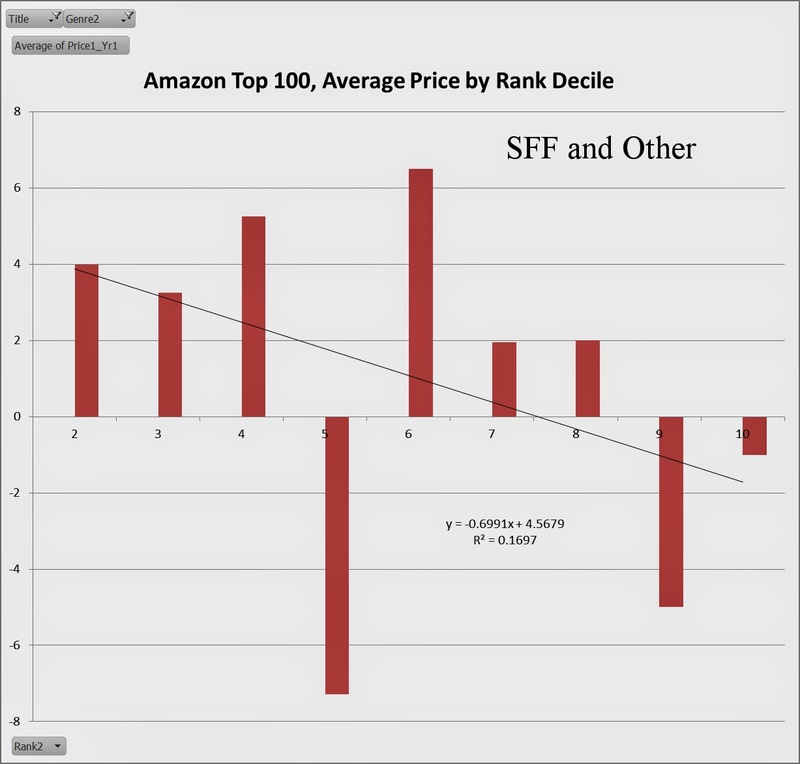 · In late 2013, when I first recorded the data for the Amazon Top 100 for 2013, I used the prices shown on the list on the Amazon website. I printed the list on Dec 16, 2013, so prices for those books are indicative of that point in time. · I revisited that list a few days ago, about Jan 20, 2015. I recorded the prices shown on that list at that point in time. I also recorded the “click-through” price, that showed up when one went to the specific book in question. There were some interesting differences in all these numbers. · For the 2014 data, I recorded both the list price and the “click-through” price. Again, there were some interesting differences. · I assume that the “list prices” represent some representative price for the book throughout the year, while the Jan 20 “click through” price was the price set at that particular time. Many of these had the notation “Price Set by Publisher”. More often than not, the price set by publisher price on that date was higher than the list price. I don’t know the details, but I presume it represents recent price increases by publishers, after re-negotiating their supplier deals with Amazon. 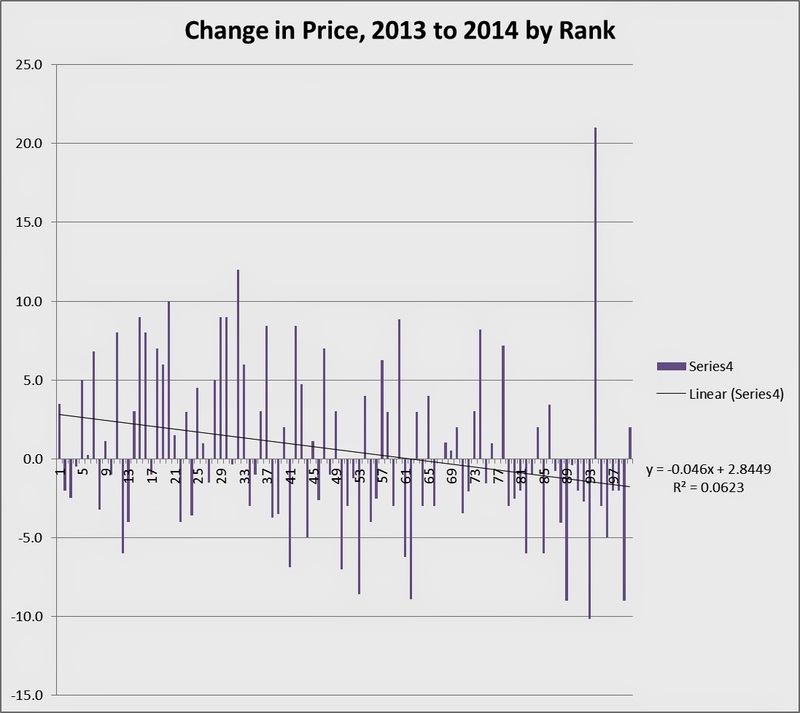 This blog will primarily address the price changes in the Top 100 lists, from 2013 to 2014, using the “list prices”. 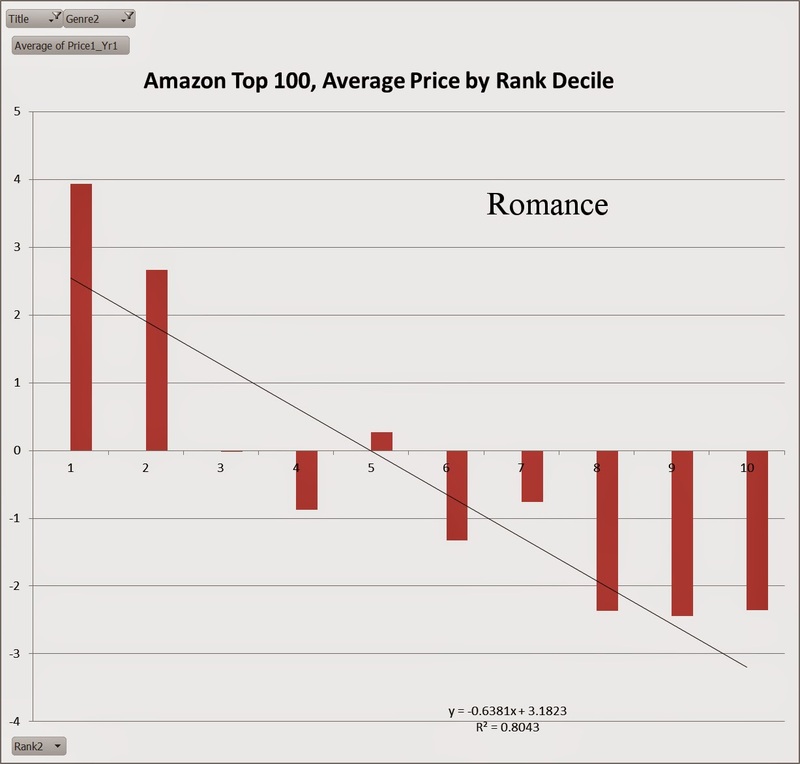 The average listed price in the Amazon Top 100 Kindle books in 2013 was $6.06, while it was $6.58 in 2014, an increase of $0.52 or 9%. 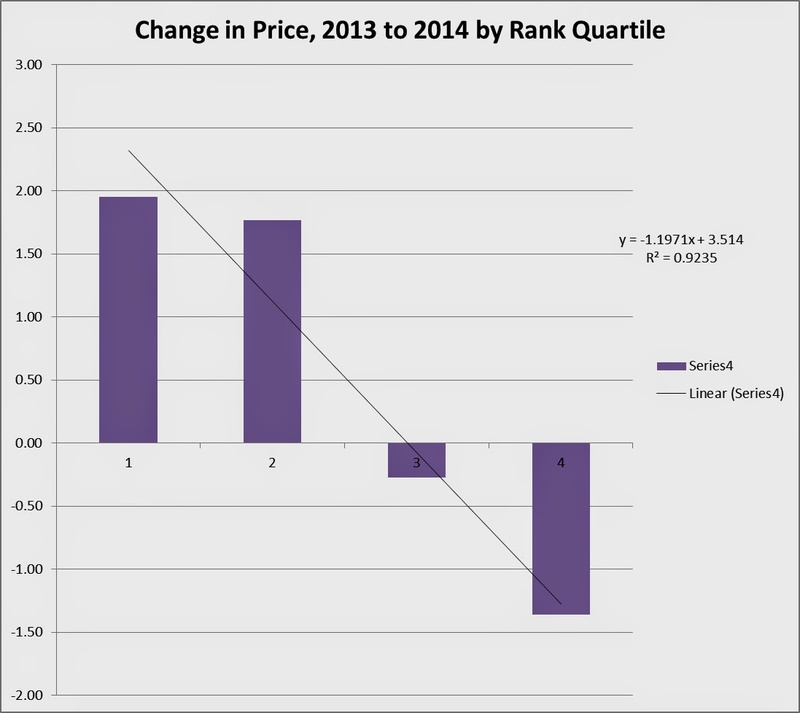 The graph below shows the change in price at each rank in the Top 100 from 2013 to 2014. The sloped line shows the general trend. As you can see, there was a tendency for prices to go up in the first half of the Top 100 and down in the latter half. But there is a lot of noise in the data. Note that the big spike in the last part of the graph is due to Thomas Piketty’s economics book “Capital in the 21st Century”, which was very popular, considering its price and subject matter. As you can see, that sort of thing doesn’t happen very often (though publishers must love it, when it does). Regrouping the data by decile (tenths of the dataset) makes the trend more obvious, as the table and graph below show. Finally, a quartile view can also be useful (breaking the dataset into quarters). So, it seems clear that there has been a change in pricing strategy between 2013 and 2014. Books in the top half of the list were up by a couple of bucks on average, while those in the bottom half were down by about a buck. The decile view shows that this was quasi-linear (kind of a straight line) throughout the range. In the analyses that follow, I will tend to stick to graphs and R-Squares to explain the findings. R-square values show how well the data conforms to the functional relationship being tested – in this case that will always be straight lines (linear relationships). I will use the decile graphs (10 bars) – they present a nice compromise between the excessive noise of the full ranking comparisons (100 bars) and the over generality of the quartile groupings (4 bars). 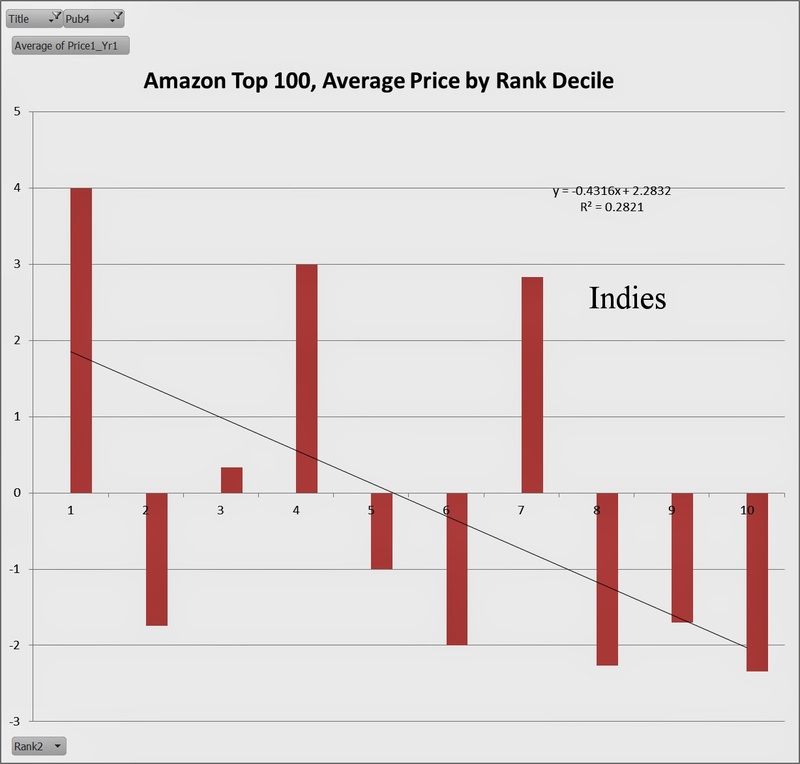 Trads vs Indies: If we look at the decile graphs by publisher type, we see something interesting – this is very much a traditional publishing strategy (Trad R-square=.60, Indie=.28). Note that I took the Piketty book out of the data, as it flips the last decile bar for Trad from negative to positive, which misrepresents the overall effect. 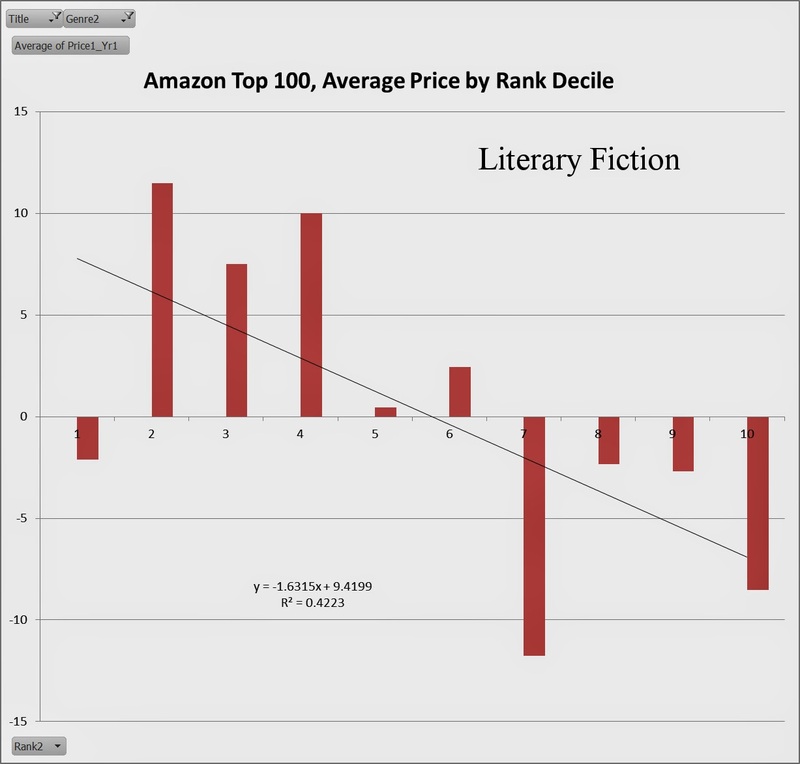 Genre: Using the five genre categories below, the table shows the R-Square of the linear effect of decile on price. The closer that number is to 1, the greater the effect. The nearer to 0, the lesser the effect. 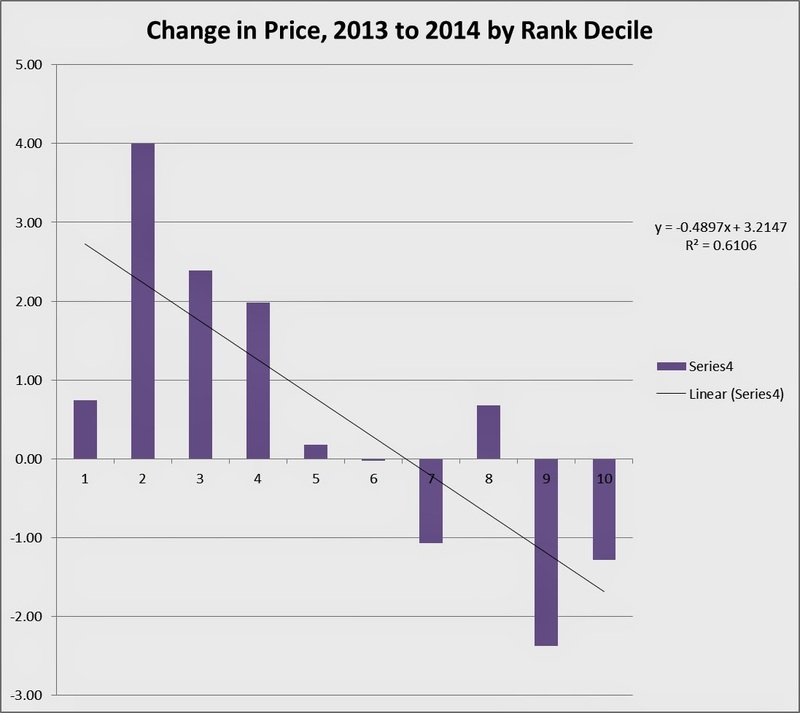 · Ebook prices have been raised from 2013 to 2014 on average by about 9% overall. · But the books in the top half of the list have had their prices raised by considerably more than this, and the books in the bottom half of the list have had price drops. · This effect is seen primarily in traditionally published books – the trend is much less evident for Indie books, though there might be some slight tendency that way. · Romance, Thrillers and Literary Fiction have been the main targets of this approach, Romance especially so. · As noted earlier, the effect of this strategy has been to bin books into highly priced books versus low priced books. The number of books in the mid-range price range has been reduced in favor of this highly stratified approach. 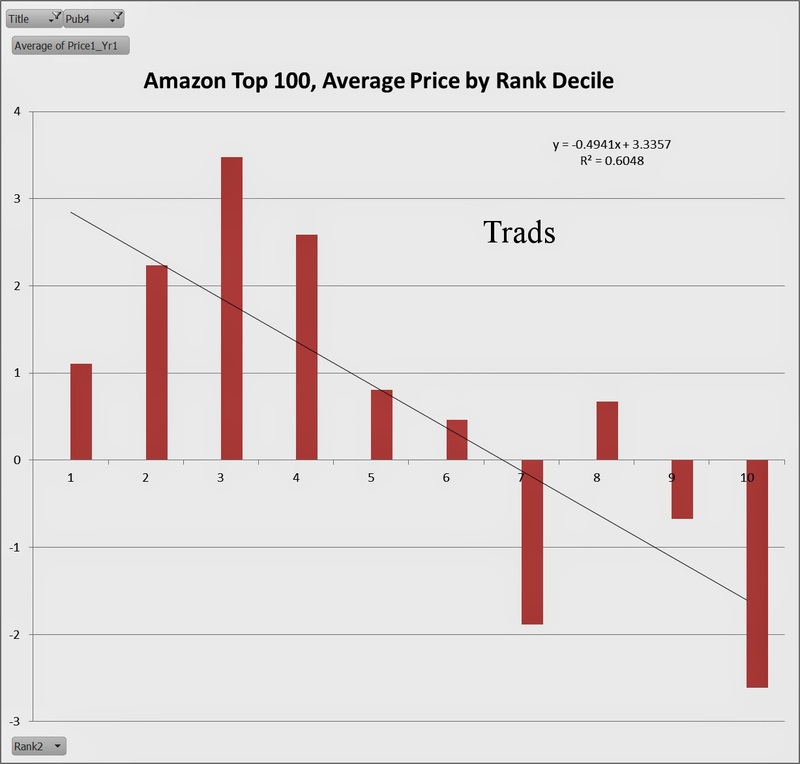 Higher prices overall, for Trad books opens up room for Indies to compete, generally speaking. But Trads are also hitting the lower price ranges, harder than they did in the past, crowding that part of the market with more of their product. So, perhaps that opens up the mid-range for higher quality independent books. As always, though, strategies and responses to competitor strategies are highly debatable.